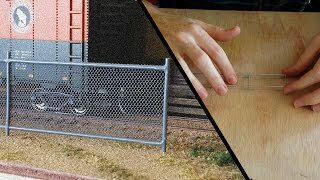 In this video I’ll be showing you a cheap and easy way to build your own HO scale chain link fence using everyday materials. There are a few commercial products available but they can start to become expensive when you need alot, this way you will be able to make all you need for less than $20. I will eventually be making these fences in bulk and making them available on ebay for those of you who would prefer to have all the hard work done for you. Hope you enjoy the video and have a go at making these fences for yourself.